NHS Highland has encouraged its employees to hold meetings standing up rather than sitting down to help improve their health. The message forms part of the health board's internal Beware The Chair campaign. 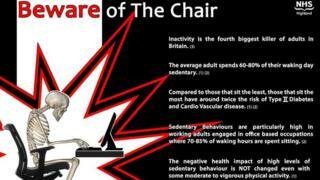 It said ill health related to inactivity was the fourth biggest killer in Britain. The campaign also suggests that staff stand up three times every hour and to go for walks in their lunch breaks. Other recommendations include standing up when on the phone, having a coffee or eating lunch. Occupational health physiotherapist Lesley Marshall said: "Many of the NHS Highland employees we treat have problems which can be directly attributed to the fact that their lives are too sedentary. "We want them to be more active, and that includes while they are at work." The Beware of The Chair campaign has been adopted by NHS Highland as a priority health and wellbeing strategy for staff.